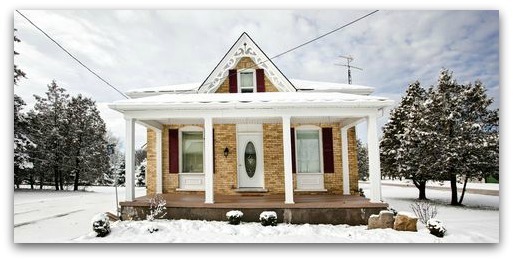 Recently moved into a new home and feeling breezes from windows and doors during the cold spell? Stop leaks now and save big bucks! Cold climates give homeowners two choices: seal now or pay later. Compiled by the U.S. Department of Energy, the “Retrofit Techniques and Technologies: Air Sealing” guide shares that residents pay an estimated average of 10-20 percent more on energy than necessary. And while proper insulation is important for overall comfort, it does not seal air. Air leaks waste energy, cause unwanted moisture and increase air pollution. Fortunately, with just a few thoughtful steps, savvy homeowners can solve major air leakage problems in a weekend or less. The most important first step to reduce energy bills is to identify areas in the home that are leaking air in or out. A homeowner can find the biggest areas of leakage by turning off the lights inside the house during the day. Any crack or gap that shows light from the outside leaks air and needs to be sealed. Another way to locate areas in a home that leak air is by holding a candle next to windows, exterior doors, and outlets on exterior walls. If the candle’s flame flickers or blows out, the area leaks. Other common leaky areas in a home include attic hatches, air ducts, basement doors, outdoor water faucets, framing gaps, recessed lights and fan vents. Any joint in the home where two building materials meet can leak air and should be assessed. When it comes to finding air leaks, attics and basements offer the most return on investment. Washington State University’s Extension Energy Code recommends homeowners start solving air leakage at the top and the bottom of the home. This is because warm air rises up through ceilings and flows into attics and outside. Meanwhile, cold air from the outside leaks into the house through cracks in foundations, basement walls and windows. The choices a homeowner faces in solving home air leakage are becoming more complex, but the tools to solve these problems are also becoming more sophisticated. Now, custom silicone seals like those used in storage containers to keep food fresh can also be used in home lighting applications to keep weather out. When it comes to stopping air leaks, the smallest detail can be the most vital. The American Council for an Energy-Efficient Economy recommends tightening up your house with different materials for different leak sizes. For larger areas, homeowners can plug leaks with rigid foam board, drywall, or sheet metal. Fiberglass insulation can also be wrapped or stuffed into plastic bags to keep air out. When handling fiberglass, homeowners should wear protective gloves and a mask. Smaller gaps and cracks like areas around plumbing penetrations are best sealed with foam, caulk and weather stripping. Deep cracks should first be filled with flexible backer rod or crack filler and then sealed with caulk. Drafty windows can be sealed with plastic sheeting and all-weather tape, while leaky doors can be sealed with door sweeps and weather stripping applied between the trim and the door. Low energy efficiency can make or break a home. Many homeowners are intimidated by the concept of sealing their home themselves, but the payoff is well worth it. Anyone can stop air leaks. By following the tips outlined in this article to identify and seal air leaks, homeowners not only save big on energy costs, they also reduce their carbon footprint and improve their home’s air quality.